Based at the companies headquarters in Germaringen, a municipality in the district of Ostallgäu in Bavaria. Specialised in the production of prefabricated piles. The plant in Germaringen is the newest factory in group. The steel is purchased directly from recognised European steel mills and complies with European steel standards. Centrum Pæle has about 65 employees working in the production and the administration. The production comprises production management, warehouse staff, welding unit for reinforcement, concrete production and casting. The administration comprises management, sales, logistics, accounts department, development, quality and laboratory functions, IT and HR/marketing. Centrum Pæle A/S in Vejle, Denmark manufactures precast reinforced concrete piles. The company dates back to 1882. The daily capacity of our two concreting halls is approximately 4,000 linear masts in the cross sections 20×20 to 45×45 cm. Precast elements are produced in 3 heated halls, total surface area 7,300 m2, with top running overhead cranes. Concrete mix is fabricated in a tower concrete batching plant erected in 2007. The reinforcements for the foundation piles are produced on-site, using a robot purchased in 2008. 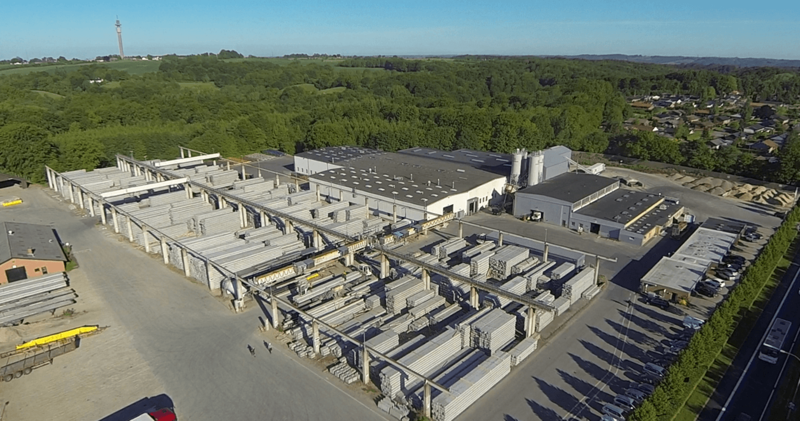 Concrete products storage area located along the production hall is 13,000 m2. There are 4 top running overhead cranes serving the storage yard. The Swedish plant, is the second youngest in the family and is now following the delivery of the new production system. CE certified manufacturer of concrete piles.